A digital PDF instant file download of a great WWII era knitting pattern in a feminine "Battle Jacket" style blouse. 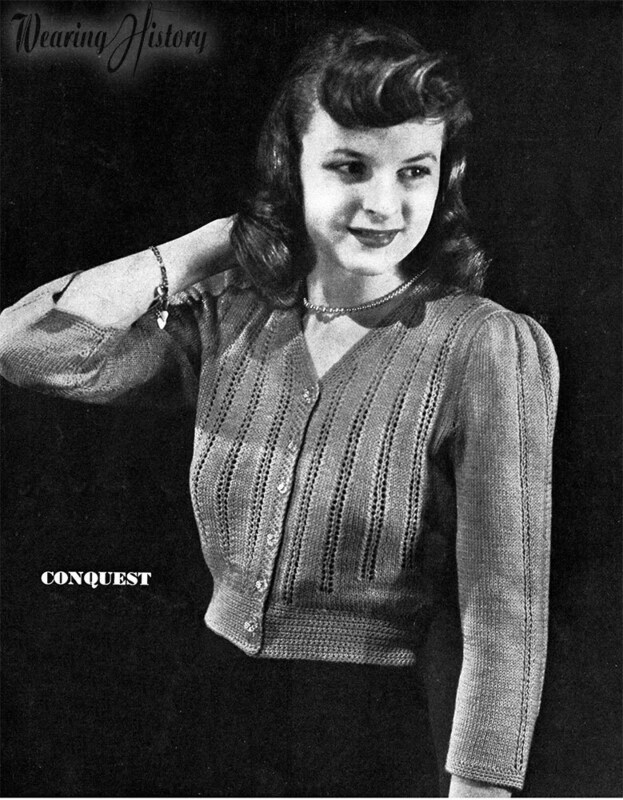 This blouse is short at the waist, with a wide waistband, buttons up the front, and 3/4 length puffed sleeves. The blouse includes vintage sizes 14-16-18 which is a 32-34-36 inch bust, 26-28-30 inch waist. -Sports Yarn or Shetland Floss. Size 14 (B 32) 7 oz. Size 16 (B 34) 8 oz. Size 18 (B 36) 9 oz. 6 1/2 stitches make 1 inch. 8 1/2 rows make 1 inch. This digital pattern comes to you in PDF format and is 3 pages in length, including instructions and a picture remastered from authentic period materials. You will be able to download this PDF file after your order has been paid. This file is 1.77 MB in size. While original physical source material is in the public domain, this digital PDF file that was restored, remastered, and put together by me is the intellectual property of Wearing History for the sole purpose of use by the individual purchasing this pattern. This pattern file may not be resold or redistributed. You may, however, make items to sell by using this pattern to create tangible knitted or crocheted objects. Please help support indie small business by respecting the use policy. Thanks! Another one I can't wait to knit up! Wonderful pattern,I am happy with it,great shop.Thank you for offering these vintage patterns!